I love that this quinoa salad can be a stand-alone meal or a perfect side with any meat or fish. Cook the quinoa the night before for faster prep, or make the whole salad ahead of time. Paleo: Use lettuce instead of quinoa. Replace corn and black beans with 1 green pepper, 1 zucchini (cubed), and other vegetables, as desired. 1. Rinse quinoa. Add quinoa, 2 cups of water, and 1 tsp salt to a medium saucepan and bring to boil. 2. Reduce heat to low and simmer, covered, for 15 minutes or until water is absorbed (or almost absorbed). 3. Turn off heat and let sit for 3-5 minutes, then fluff with a fork. Rinse quinoa with cold water or allow to cool. 4. 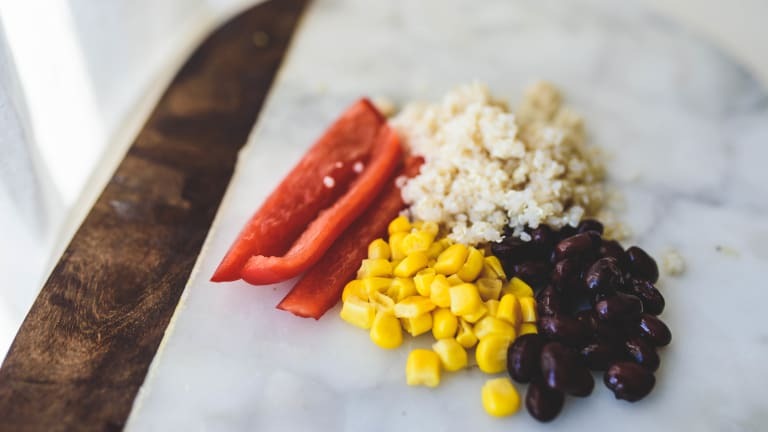 In a large mixing bowl or serving bowl, mix quinoa, black beans, corn, bell pepper, and cilantro. 5. Whisk together the dressing ingredients and then pour over the quinoa mixture. Toss to combine. 6. Add another splash of olive oil if the dressing isn’t coating everything. You can let this chill in the refrigerator for several hours (or a couple days) or eat it immediately.